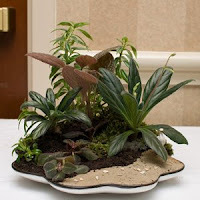 The National Capital Area Chapter of The Gesneriad Society: Class 64 - Tray landscape under 12"
Class 64 Tray Landscape - not to exceed 12" in any dimension. Entry No. 271, Tray Landscape under 12 inches, exhibited by Karyn Cichocki. Score: 95. First Place. Entry No. 502, Tray Landscape, under 12 inches, exhibited by Paul Kroll. Score: 82. Second Place. Entry No. 209, Tray Landscape under 12 inches, exhibited by Barbara Stewart. Score: 78. Third Place.